Hangouts Meet recordings have been supported to this point in G Suite so that isn’t new. 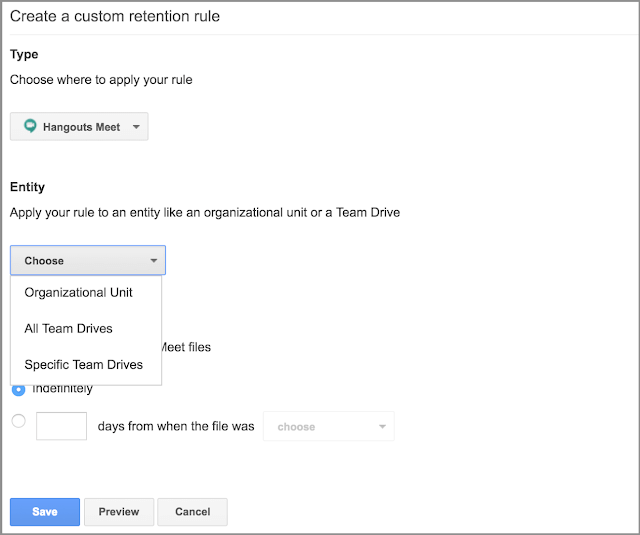 What is new is that you can set a different retention policy for those recording than what is set for Drive. Previously, whatever the Drive policy was on your domain was applied to Meets recordings too. Now they are separated with a retention policy for each. Speaking of Drive, with this update to Vault, admins can now set a specific retention policy for Drive trash folders of users. This allows for the creation of policies that are separate from Team Drive and is only applicable to the individual user’s Drive trash folders. Finally, an improvement to the searching of domains in this update as well. Now you have a much faster and more transparent searching of larger domains and Organizational Units (OUs). All of these changes have been released to G Suite domains that are on G Suite Business, Enterprise, and Education editions only, as well as G Suite users with the Vault add-on customers. The rollout of these changes is expected to take up to 15 days so if you aren’t seeing it on your particular domain yet, it is just a matter of when it is updated on the cloud side from Google.